In which we talk to Push Peeps and friends about their favourite climbs in and around Vietnam. This week we check in with Luca De Giorgi , co-author of Vietnam Climbing about the Viet climbs that set his pulse racing. “What I’m mainly looking for in climbing is the adventure. Vietnam’s most adventurous climbing is surely to be found roaming Ha Long Bay and make trad and DWS [Deep Water Soloing] first ascents. I’ve spent many memorable days doing this, but the best has certainly be that time we did the FA of the Big Ben’s south face. Big Ben is a beautiful rock pillar towering up to 80 meters over Lan Ha Bay. It’s south face has a 50 m slightly overhanging wall, with two prominent cracks running through it. It looks amazing, daring and just barely possible without bolting the whole thing. I had been up Big Ben several times and always searched wistfully for the perfect line up it. Every Asia Outdoors guide kayaks past it on his boat shift and I’ve heard many times people saying they wanted to climb it, including me, but for one reason or another we never got around to doing it. More than two years after first seeing that line I was back in Vietnam to write the 2018 edition of Vietnam Climbing. There happened to be a very strong Canadian climber working for Asia Outdoors, Kyle Noruschat. He also happened to be an experienced trad climber and interested in first ascents. One thing led to another and one day we finally boarded Thu Bien’s basketboat, headed for Big Ben. We were excited, a bit scared and super motivated. This was the chance. What followed was a truly amazing climbing day. The line was technically not too hard, but the placements were ranging from very good to none at all, making it a very demanding climb, especially during the first ascent. I remember finally getting to the ledge at the end of the second pitch and laughing out in joy and relief. First ascending that pitch was a gift, especially since we did it without the need to bolt. I’m very grateful to Kyle for teaming up with me that day. 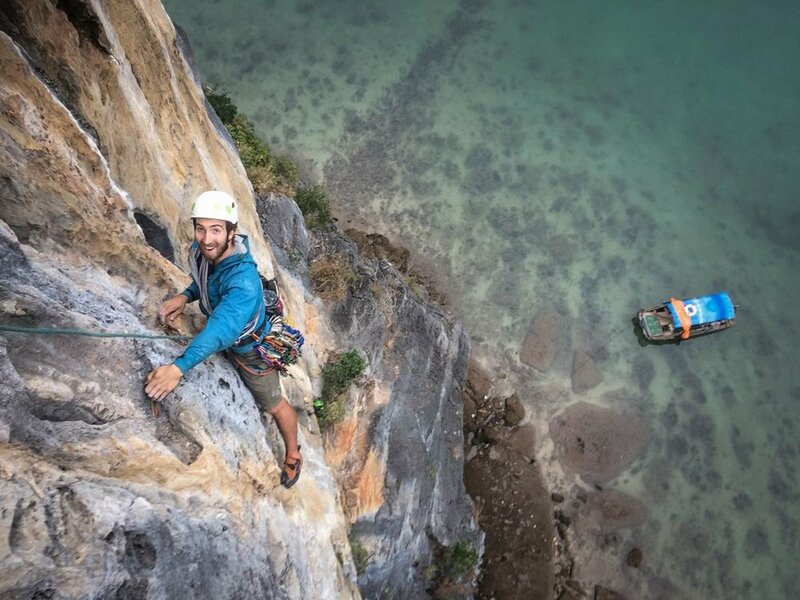 He stayed a bit longer in Ha Long Bay and eventually got the first ascent of the line as well as making the FA of the other crack, with an unbelievable crux graded at 7b with a long run out."